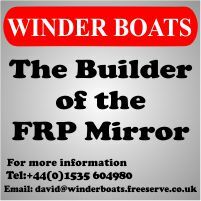 Mirrors built up until the late 1990s were constructed using polyester resin and Aerolite 306 glue. In my experience Aerolite 306 appears to break down after about 25 years, so glued joints failing is a common sight on older boats. Since then most builders switched to epoxy resin for taping and epoxy resin plus thickening additives to make wood glue or to make fillets. Today, the UK MCA recommends the use of epoxy systems. Epoxy resin is superior to polyester in every respect apart from resistance to ultraviolet (UV) light degredation. Once a joint is complete, epoxy resin needs protecting by a good quality paint or varnish with a UV inhibitor. 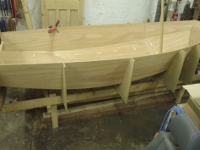 We have some photos of a fantastic wooden boat built with epoxy resin taping and fillets .